Versa-Trak is the retail solution to keep your product where it should be: in front of the consumer. Your customers will no longer see an empty or disorganized shelf or have to reach to the back of your display to get what they want. With Versa-Trak, the product is maintained by spring tension that allows the product to move forward once a product is removed. This will keep your display area attractive and organized and will let employees spend time helping your customers rather than continuously organizing your display areas. Versa-Trak gives you the freedom to design display systems that fit your needs. From a conventional shelf to a wire display, Versa-Trak is versatile and can work with a wide range of display systems and shelf depths. Contact us today to learn more. No longer constrained by a standard shelf system offered by others, with Versa-Trak you now have the freedom to design the display you need and want. With the ability to provide a shelf management system of any width or depth, Versa-Trak is your answer to thinking outside of the standard shelf box and allowing your creative side to shine. Versa-Trak products are versatile and can be used independent of each other or together as an assembled shelf system and can be used in various displays such as conventional lozier shelves, wire rack displays, cardboard displays, acrylic displays, and even drawer-type displays. 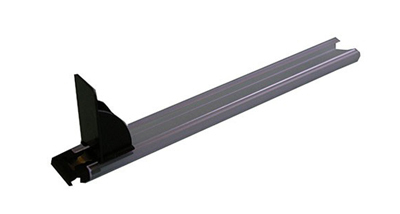 Versa-Trak even has the ability to create a custom pusher tension specifically for your product. We invite you to contact us to learn more about Versa-Trak and how Versa-Trak can keep pushing you to greatness. Are you looking to revitalize and instantly add facing to existing shelf displays and increase your sales? Our Drop-In Pusher is an on-track pusher design for use on any flat surface and display that currently has an existing front fence. Our Drop-In Pusher will keep a large variety of products facing forward, giving your retail space an organized and well-stocked appearance. We currently offer three sizes of Standard Drop-In Pushers in two different widths to accommodate standard shelving: 12 inches, 14 inches, & 16 inches. Each Drop-In Pusher comes in a light, medium, or heavy pusher tension; you also have the option to add a pusher extender for more surface area or a double-sided adhesive to apply the Drop-In Pusher directly to a shelf display. Are you looking for a particular sized Drop-In Pusher? Versa-Trak also offers custom sized Drop-In Pushers based on your display configuration and can even create a custom pusher tension for your product. Contact us and let our design engineers help you today.